( Clean Energy Wire) – Energy transition home country Germany eyes a phase-out of coal power by 2038 at the very latest, as the country tries to get back on track to create a climate-friendly economy. In its highly anticipated phase-out proposal, the country’s coal commission said the world’s fourth largest economy could also wean itself off coal by 2035 if conditions are right. The deal, which was sealed after a 20-hour negotiation session, was welcomed by most NGOs, researchers, and business associations. But climate activists said the pace of the exit was too slow and therefore violated international climate targets. The use of coal is not the only blemish on Germany’s emission record – two additional commissions will now work out how to clean up transport and heating, where agreements are widely considered to be even more difficult. Germany’s task force in charge of proposing how the country can stop burning coal to protect the climate has reached a compromise on how to approach this daunting task and when to complete it, following months of heated discussions. “The commission recommends the end of the year 2038 as the closing date for coal-fired power generation,” the commission’s highly anticipated proposal said. Under the right conditions, “this date can be brought forward to 2035 at the earliest,” according to the document totalling around 130 pages. In a first step, coal-fired power plants with a capacity of 12.5 gigawatts should be shut down by 2022 – nearly one third of the capacity in 2017 – to rein in emissions that currently overshoot Germany’s climate targets significantly. If adopted by government, the proposal would make Germany the largest economy on the globe with concrete plans to end the use of coal to produce electricity. But the task at hand will require strong political leadership, and it remains uncertain whether the fragile government coalition will muster the necessary strength. Both Chancellor Angela Merkel’s CDU as well as her coalition partner, the Social Democrats have slumped in polls and last year’s regional votes, and elections in East German states – including lignite mining states – loom large. Concerns that voters may perceive any deal from the coal commission as a burden had made both parties nervous as the right-wing populists are polling strongly in East Germany. At the same time, voters in favour of more climate action have been flocking to the Green Party, while international criticism of German climate policy has also increased. 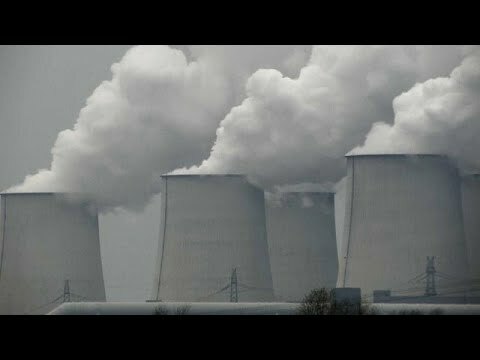 Stopping the use of coal is more difficult for Germany in comparison to many other countries because it is still heavily reliant on the fossil fuel, some of which is still mined domestically, and because it is phasing out nuclear power at the same time in its landmark energy transition (Energiewende) towards renewables. Germany’s efforts are closely watched by other countries heavily reliant on coal, such as neighbouring Poland. Former coal mining state premier Stanislaw Tillich, who also co-chaired the commission, said the agreement provided “an example to other coal regions in Europe and beyond,” and should inspire them to follow suit. But critics have already warned that Germany’s decision to ease the way out of coal use with generous compensation payments will make the exit unnecessarily expensive and put other countries off. The regions affected by the structural change should get financial support of what regional politicians said would amount to 40 billion euros over 20 years. The deal also includes suggestions for ways to compensate coal plant operators and buffer the effect on industry and households from any rise in power prices in the wake of the coal phase-out. Lignite mine and coal plant owner RWE warned the deal would have considerable impact on the company and its employees, adding that it took a critical view of the commission’s wish to preserve the embattled Hambach Forest, set to make room for a lignite mine extension, that has become a powerful symbol for climate activists. Germany has managed to rapidly increase the share of renewable power to around 40 percent of the electricity it uses, and has even covered its entire power use with green sources over short periods. But the country must also phase out coal to fulfil its climate pledges, as the rapid roll-out of renewables alone has not lowered greenhouse gas emissions sufficiently. This is why Germany set up the coal commission last year to settle the matter in a broad consensus. Its mandate was to find economic perspectives for coal workers and regions, and to spell out measures to reduce carbon emissions in line with Germany’s climate targets, including an end date for coal-fired power production, the most prominent blemish on Germany’s emissions record. The task force proposal is not binding, but the government is widely expected to follow its recommendations because the commission is backed by a large parliamentary majority. The deal was greeted by most NGOs, researchers, and business associations as an important milestone for Germany’s climate protection efforts. 27 of the 28 commission members – including representatives from the business community, coal mining regions, and scientists – voted in favour of the agreement. Only the representative of villages threatened by lignite mine extensions in East Germany voted against it, saying the deal lacked assurances for the inhabitants of those places. Greenpeace and other climate activists said the timetable violated the Paris Climate Targets, but also welcomed the agreement in general. „At least Germany is moving again after years in climate policy coma,” said Greenpeace’s commission member Martin Kaiser. The commission did not rule out that the use of coal to generate power in Germany might even end before 2035. Commission leader Pofalla said market developments could make coal power unprofitable in the early 2030s. The phase-out deal was mainly designed to ensure that Germany can fulfil its target of reducing emissions in the energy sector by more than 60 percent by 2030, compared to 1990 levels. This will only be possible by switching off around half of its coal power plants by then. 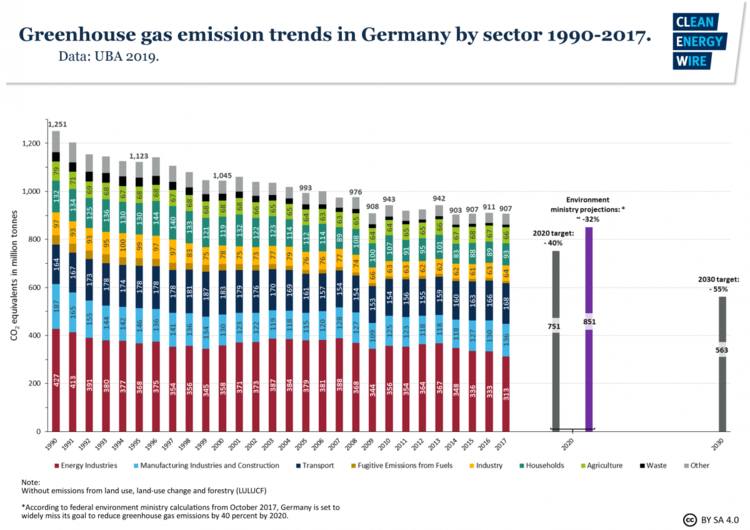 Germany can only reach its overall 2030 climate target if emissions are also sharply cut in other sectors of the economy, notably in transport and buildings. Two additional commissions similar to the coal commission are to work out proposals how this can be achieved. But most experts warn that cleaning up these sectors will be even more difficult and controversial than a coal exit, because it is likely to interfere with people’s daily lives. The transport commission’s consideration of a speed limit on Germany’s autobahns and an increase in fuel prices already sparked a public outcry. The commission reiterated a common request from many energy experts that the country should overhaul its system of energy taxes, levies and surcharges to allow for better integration of all energy-consuming sectors. The commission fell short of calling for a carbon price, however, only recommending the government “examined” to introduce a price on CO2 in the areas not governed by the European emissions trading system. Commentators agreed that the deal was only the start for a challenging road ahead. Implementing the coal exit will also require a decisive policy initiative. “The real job only starts now,” said Patrick Graichen, director of energy policy think tank Agora Energiewende*. He added a coal exit will only materialise as planned if the government pushes the roll-out of renewable energies, expands the power grid, and makes power markets more flexible. All texts created by the Clean Energy Wire are available under a “Creative Commons Attribution 4.0 International Licence (CC BY 4.0)” .